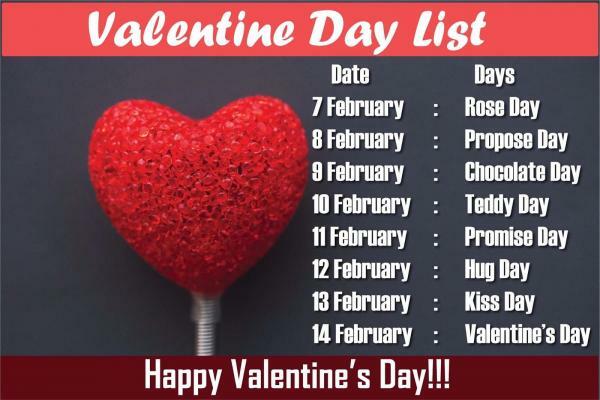 Check out the complete valentine day list. We have made a quick go to valentine week list 2019 for this February. The yearly love days are around the corner. Every year, the Valentine’s day is celebrated on February 14. The love is in the air feeling has started to surface. The days just before the Valentines day are observed as valentine week. Each day of the valentine’s week holds a specific significance for this love festival. The week of valentine starts from February 7 with Rose Day and continues till 14th February, i.e., Valentine day. Some people also observe the days after it. They are regarded as the anti-valentine week. It also consists of a seven days. This year, Rose Day 2019 falls on Thursday. On this occasion, roses play an important role by helping you in letting your loved ones what and how much they mean to you. Red roses are associated with romance, yellow roses to friends, white roses to end fight as they signify peace. This year, Propose day will be celebrated on Friday. It is the time to let you express your feeling for the loved one. This day comes at number two in the valentine day week list. You can use it to purpose your crush and let him/her know how much you like her/him. Chocolate day 2019 will fall on Saturday this time around. You can utilize this day to express your feelings to a friend, family, or loved ones. People of all ages like chocolates and chocolates have also been used to signify love for ages. Teddy day 2019 will be observed on Sunday. The fourth day of valentine week is dedicated to teddy bears. They are probably one of the best ways to say “I Love You” to somebody you love whole-heartedly. Surprise your cush, friend, or any person who holds significance in your life on this Sunday. Gift them a teddy bear. It’s one of the common gift that everyone would like from couples to siblings to even parents. It’s a significant day in the list of valentine day week. It will be celebrated on Monday in 2019. Promise day can be used to reaffirm the commitment in the relationship and the bond increases for lifetime. You can send a text message to your loved one, and promise them your loyalty and love. In 2019, hug day will be observed on Tuesday. A hug comes to the rescue when words can’t do their job. So, go ahead and hug your partner, friend, love, or family members. Just before the valentine day, the week list brings the Kiss Day. In 2019, it will be observed on Wednesday. Generally, a kiss represents affection and love. There are different types of kisses. A simple kiss can make your and your partner’s day this valentine week. The day of love will be celebrated on Thursday in 2019. It’s the most awaited day in the valentine week list. The valentine day list ends with it. It is celebrated to honor Saint Valentine, a 3rd century Roman saint associated with courtly love.